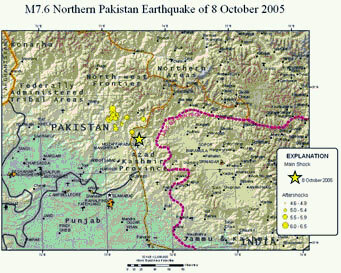 A devastating earthquake, measuring 7.6 on the Richter scale, hit the northern part of Pakistan on the morning of 8th October, 2005. Estimates of the quake's magnitude varied. The US Geological Survey put the number at 7.6. With the death toll in the tens of thousands and the casualties in the hundreds of thousands, it is a catastrophe on a scale never before seen in this region. We realize that our task does not end when the last victim has been laid to rest, when the last casualties have been treated or when the last rescue team has left. It will take months, even years, to rebuild the areas that have suffered so much damage. The psychological scars will take even longer to heal. The task is an ongoing one and all kinds of assistance will be required for a long time to come. Join us and do your part to make a difference. Most of the casualties resulting from the earthquake were in Pakistan where the official death toll has topped 79,000 and is expected to continue to rise, putting it higher than the massive scale of destruction of the Quetta earthquake of May 31 , 1935  . 1,300 deaths have also been confirmed in India. Rescue and Relief operations in many remote villages are in an inferior position, as roads are covered in ruins and many affected areas remain unapproachable. Heavy equipment is needed to clear the roads and to rescue survivors buried under the earthquake wreckage, as many rescuers are still picking the rubble with pickaxes and their bare hands, looking for survivors. ISLAMABAD, Nov. 1 (Xinhuanet) -- At least 17,000 Pakistani children died when their schools collapsed in the giant Oct. 8 earthquake and the trauma for survivors is worse than after the Asian tsunami, according to local press reports on Tuesday. "We are estimating that at least 17,000 pupils were killed in schools, that's the one number that we have some estimate on," UN Children's Fund executive director Ann Veneman told reporters in Islamabad on Monday. According to UNICEF estimates, some 1.6 million to 2.2 million children have been affected by the earthquake, which has killed more than 55,000 people and made 3.3 million homeless. Talon Fair Trade Workers Welfare Society help that affected children in kohorri.Kohhari is 35 KM Distence from Muzzafra Abad, Azad Jamu Kashmir. TFT supported for education project in Kohorri. TFT provide their Books, School Bags and other Stationery.